Next to the chair, the table is perhaps the oldest form of furniture known to man. Certainly, it's one of the most versatile, with styles ranging from delicate and mobile to massive and ceremonial. Tables are often key specimens of a particular style, era or furniture designer. Listed below are several of the most common types of antique tables collectors are likely to encounter. 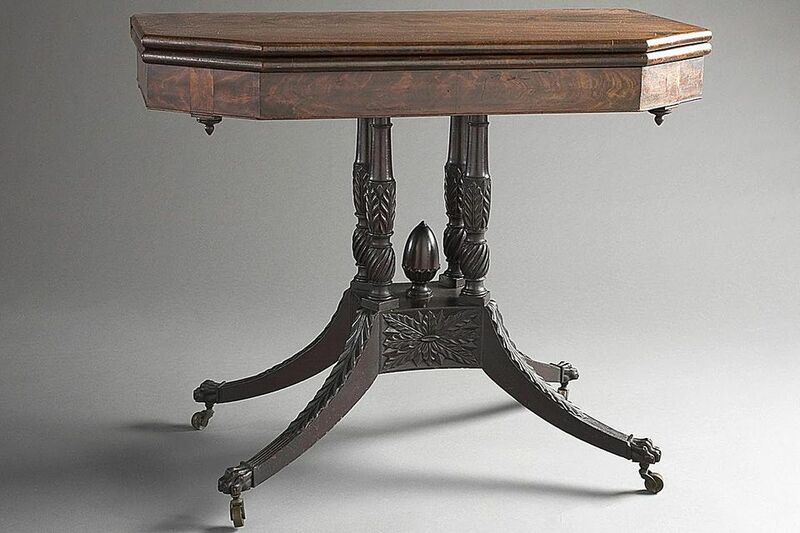 Though the forms may date back centuries, most of them remain common today and can be found in both antique and modern versions.​ Click on the name of the tables below to read articles and see examples of varied occasional and dining table styles. Butterfly Table - These drop-leaf, gate-leg tables are used for dining. The term butterfly refers to the wing-shaped braces that hold the leaves up when they are in use. Console or Pier Table - A console table has one plain, straight side that is placed up against a wall. The other side of the table can be quite ornate. Early console tables were attached to the wall. Pier table is another name for this style of table. ​​Demilune Table - The name of this type of table refers to its shape since demilune translates to half moon. They can be shaped like a semicircle or have a leaf that drops down to form a full circle when raised. These could be stored against a wall, and then moved away for serving as needed. Gate-leg Table - This useful type of dining table has legs that swing out to support leaves when a larger table is needed. Often used in small settings, these can be stored against a wall and used as accent tables when they are not being used for dining. Guéridon Table - These small tables were originally used as candle stands, many times in pairs, and often in the shape of a Blackamoor. They usually have a pedestal base with a round tray-like top and have been made in many different styles since they were first used in the 17th century. Hutch Table - Often called chair tables, the tops flip up and lock so that the table base can be used for seating. The base will also have a drawer for storage often, thus the reference to a hutch in the name. Kang Table - This type of table can be used as a modern cocktail table. They were originally used in China on a Kang, which is a raised platform for sleeping or relaxing. Pembroke Table - A type of small table that is portable, with small leaves that fold down on each side. Originally dating to the mid-1700s, these are usually rectangular with rounded edges. The petite leaves allow for versatility in use as an end table or a small serving table when they are raised. Tea Table - Tea tables were used for tea presentation at a time when the leaves to brew the beverage were a sought-after commodity. These small tables were stored out of the way and then moved to the center of the room when it was time for the tea service. Trestle Table - This type of table dates back to the middle ages. They have rectangular tops sitting on two or more trestles. They originated as simple, portable pieces of furniture but grew more and more ornate as time passed.